Fund My Mutual Fund: HAL9000 Taking a Break? According to the WSJ, the lack of volume in the market signals HAL9000 and his merry band are not finding as many opportunities as in the good ole days. While a contributing reason, I also believe a lot of people in their 40s and 50s, burnt twice by double bear markets the past decade, have simply thrown in the towel on equities. The flash crash a year ago probably chased out quite a few as well. Whatever the case, a lot of old adages in the technical analysis arena that are related to volume have had to be ignored to participate in the almost non stop rally. When stocks collapsed in a free fall last May, the fear was that the market had been taken over by high-speed computers that had run amok. A year after the "flash crash," which saw the Dow Jones Industrial Average plunge 600 points in less than 10 minutes, the stock market is a much quieter place. Companies that use fast-trading, computer-driven strategies, which were painted by some as culprits of the collapse, have curtailed trading. So, too, have many long-term investors, for whom the trauma of that May 6 afternoon was the final straw after a decade of stock-market turmoil. 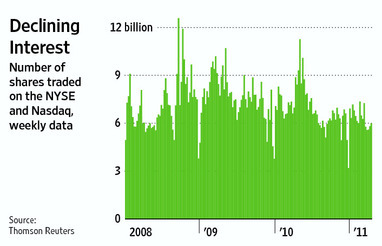 In their absence, trading volume and volatility have plunged, further deterring high-frequency traders. High-frequency strategies "have less to work with, so they don't participate, which creates less volume," said Will Mechem, a managing partner at high-frequency trading firm Pan Alpha Trading. "This would seem to be a vicious cycle." In the first four months of this year, average daily trading volume of stocks listed on the New York Stock Exchange and Nasdaq Stock Market is down 15% from 2010's pace, running at an average rate of 6.3 billion shares a day. Volume has been edging lower throughout the year, with April's daily average of 5.8 billion shares marking the slowest month since May 2008. Volume had marched higher for most of the last decade, escalating during the financial crisis. It doubled between 2006 and March 2009, when an average of nine billion shares changed hands every day. The declines in volatility and volume have been bad news for high-frequency traders, whose strategies generally rely on squeezing profits out of the tiny differences between the buy and sell orders of stocks within a fraction of a second. Rosenblatt Securities Inc. estimates that high-frequency traders would have made, on average, five cents to 7.5 cents per 100 shares traded in the U.S. stock market in 2010. That is down from 10 cents to 15 cents per 100 shares in 2008. Also contributing to lower volume, traders said, is a number of hedge funds that use computer-driven strategies known as statistical arbitrage have scaled back trading or shut down altogether as poor returns in recent years sent investors fleeing. Some observers said those lofty levels of trading activity were never an accurate picture of demand among investors to buy or sell stocks. Rather, it was a reflection of computer-driven traders passing securities back and forth between day-trading hedge funds. This phantom liquidity, they said, was unmasked during the flash crash. "Retail investors returning to the market would help," said Pan Alpha's Mr. Mechem. "Also, there has been a recent increase in cash flowing into hedge funds, so we would expect that to drive volume as capital is deployed."